When he was 15 years old, Wu Muye studied playing the piano at Conservatoire National Superieur de Musique et de Danse de Paris, the music school of the Paris Conservatory, from where he graduated in 2009. The pianist says the city brought him closer to the music of some of his favorite composers, Frederick Chopin, Claude Debussy and Franz Liszt, all of whom lived in the French capital at some point in their lives. Chopin arrived in Paris in 1831 and never returned to his homeland, Poland. In Paris, he forged a friendship with the Hungarian composer Liszt. The French composer Debussy frequently played Chopin's music during his studies at the Paris Conservatory, he says. "And all of them developed a close connection with Paris, where I stayed for about 10 years," says Wu, 32. Now, he is conducting a nationwide tour interpreting their masterpieces, including Chopin's 24 preludes, Debussy's Clair de Lune and Liszt's Dreams of Love. Wu enjoyed strolling around Paris. He says the old buildings, narrow lanes, with their walls and street lights, made him feel connected to the composers, whose music he wants to play authentically. "I have been to places where they lived. When I play their works, it feels like I am having a conversation with them." The pianist recalled his years in Paris and sought to convey his feelings through his performance, when he played Debussy's Clair de Lune at the gala of the G20 Summit, which was held in Hangzhou, Zhejiang province, last year. Wu studied with French pianist Jacques Rouvier at the Paris music school. "One of the most rewarding parts of learning with him was that he taught me lots of things, which I couldn't have learned just from the score," says Wu. "While keeping the tradition of Liszt's musical style, he also let me incorporate my own understanding of the music." During his ongoing tour, the pianist is also playing pieces that he adapted from popular Chinese folk songs, such as My Motherland, and his own composition, Yuan, which was inspired by The Interrupted Dream, a well-known Kunqu Opera piece based on the play The Peony Pavilion by Ming Dynasty (1368-1644) writer Tang Xianzu. Born in Beijing in a family of musicians, Wu started learning the piano at age 4, giving his first public performance in a piano competition in Hong Kong at 5 and winning the first prize. 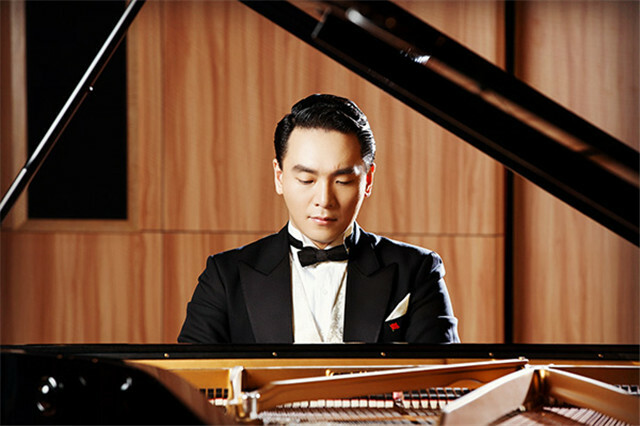 Like many promising child pianists, he was enrolled to study at the primary and middle schools affiliated to the Central Conservatory of Music in Beijing, where he received solid training in technique. Graduating from the Paris Conservatoire with the highest diploma, Perfectionnement Piano, he was feted for his excellent technique and his expressive playing. He undertook his first tour in his home country in 2009, and performed with China National Symphony Orchestra in Paris in 2010. In 2014, to mark the 50th anniversary of the establishment of diplomatic relations between China and France, Wu played Chopin's Polonaise in A-Flat Major, Op 53 at the opening gala held at the Grand Palais in Paris. The same year, the pianist played in Beijing along with China National Symphony Orchestra under the baton of French conductor Michel Plasson. His latest tour commenced in Beijing on Friday and will run through November in cities, including Shanghai, Guangzhou and Hangzhou.